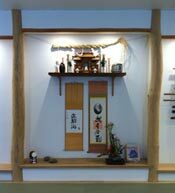 It is now possible for Aikido students to stay in the Ibaraki Shibu Dojo and train as uchi deshi. The atmosphere of training in O-Sensei’s dojo is truly a great experience. Many of the instructors have trained extensively under the direct guidance of Ueshiba O-Sensei. See the information below, and go to the Ibaraki Shibu Dojo website for further instructions about staying and training at the dojo.